Just throwing it out there: there is no current scientific data to back white hooves being weaker than dark hooves. So why does this myth continue to circulate? Because of books like this, or various equine "experts" proclaiming it to be true. Yet when we think about it, what are those "professionals" (be it or not) basing their opinion on? My theory is that they are basing it on "experience". Psychology proves that when we possess a theory, we then (often inadvertently) look for examples to prove our theory valid. Now if someone has an open mind, they may, through broad research, prove themselves wrong and thus undergo a change of opinion. Yet what sorts of examples do professionals experience, when it comes to feet? A farrier does the feet of countless horses over time, and may theorize white hooves to be weaker because he/she seems to run across more horses with white feet that also happened to be weaker. A trainer or owner may run across a number of white-footed horses whose feet were constantly chipping. Yet what do these anecdotes really prove? When we really think about it, nutrition, environment, weather, use, genetics, etc, all play major factors in a horse's hoof health. All the aforementioned factors could even be commonalities between horses a certain professional sees, hence their drawing certain conclusions. Personally, I think the real accurate testament of the different degrees of strength between white hoof and black hoof is scientific evidence. Personal accounts are not enough and are definitely flawed (whether through restriction of research or through human flaw itself), yet too many people continue to rely on WOM - consider it "the Way, the Truth, and the Life", when that just isn't the case. "Anecdotal evidence exists on both sides of the argument. However, no scientific evidence has yet to be produced to indicate that a white hoof is weaker than a darker one. A 1976 study by James E. Dinger of the University of Maryland entitled "Recent Findings in Hoof Physiology" found no correlation between hardness of the hoof wall and the pigmentation of the hoof. More recently, scientists have viewed cross-section slides of hooves under electron microscopes and failed to find any structural differences between white and black hoof walls, according to Mitch Taylor, a certified journeyman farrier with 22 years' experience and owner of the Kentucky Horse Shoeing School in Mt. Eden, Kentucky." "One of the foremost experts in his field, Doug Butler, Ph.D., of LaPorte, Colo., is the author of The Principles of Horseshoeing, one of the most widely used texts on horseshoeing in the world. He also has 30 years of teaching experience and acts as a consultant and lecturer on horseshoeing. In 1976 while doing research at Cornell University, he conducted a study on white versus black hooves by taking squares of hoof material and crushing them in a compressor. "There was no difference between black and white," he agrees. "The main difference was in moisture content: The softer hooves fell apart easier." He notes that genetics also play a role in hoof strength." Horses Ban for Overgrown Hooves - it's a few years old now, but wow - look at those feet! Poor horse, and poor owner if her claims of illness are accurate. I hope both are in better health now. 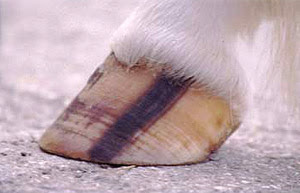 A horse's hooves should be checked on a regular basis - daily or weekly if possible. Typically, horses will require trimming every 6-10 weeks, as a good rule of thumb. Personally, I do not usually go by the 6-10 week timeline, but rather judge our horses' feet on a daily basis and call in the farrier as necessary. Link, our Thoroughbred, has his feet done every 8 weeks at the moment (in the summer) - leave them any longer and they start to chip out. He's been off the track 10 months now and while his hooves continue to improve in leaps and bounds, they are still far from perfect yet. Over the winter however, he was done at about 9 weeks and 13 weeks. Silver, our Quarab, and Koolaid, our Warmblood x, were done at much longer intervals both this winter and spring. I have received horses in for training who have never had their feet done - at 4 or 5 years of age! Those horses still have fantastic feet. One mare the farrier commented had the best feet he's seen in awhile (well, he sort of groaned it out - he was having a tough time clipping through such hard hooves!). One has to consider each individual horse's needs and evaluate a horse's feet on a horse-by-horse basis. Don't make it an automatic 6-10 weeks, because that might not be enough (rarely), or it could be too often even! Learn how to accurately judge your horse's hoof length and what is "too long" (besides the clearly obvious, as above). We pasture all our horses, so they actually seem to wear their feet down quite nicely throughout the year; horses kept in a "natural" environment akin to wild horses often require less trimming because their hooves wear down on their own. Environment, weather, genetics, season, nutrition - all play a huge role in how often a horse's feet need to be trimmed. In winter, of course, a horse's feet grow slower than in the summer (just like our fingernails), so trims are required less often during that season - our horses usually receive a trim late fall and do not require another one until spring sometime. If in doubt, ask your (reputable) farrier and if you are new to horses, certainly keep a schedule of 6-10 weeks. However if you can learn what to look for, you can probably save yourself a fair bit. Evaluate your horses as individuals!